Tonight my wife and I celebrate our twenty sixth anniversary. It was a stiflingly hot 90+ degree day in one of the quaintest small town churches I've ever darkened the doorway of, Gorham United Methodist. I remember my brother Paul jokingly telling the videographer that he hoped it would be over in 30 minutes to save us all from the heat. I also remember my best man Rob handing me a paper towel to wipe the sweat from my brow on the altar. Most likely sweating for a couple of reasons, least of all the heat. So last year was the big, recognized 25th anniversary. 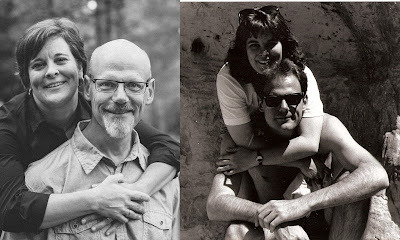 There's something epic about making it a quarter of a century with your soul mate. I might add that we've had a stable relationship the whole time - never a point where either of us even considered walking. I was pretty definite that I was in this through thick and thin when I signed on the line and swore under a Biblical oath. Thankfully God has blessed me with a perfect companion, someone to thrash and flail through this life when the waters are rough and someone to skim along the surface with when things are calm. While our marriage isn't perfect, (whose is?) we do have it very good in that we hardly ever fight and if we do, it's forgive and forget. It's funny when we do argue sometimes - not even seriously - our kids always jump in with a joking comment, "Divorce is not the answer!" It is so funny because the thought is so far from both of our heads that it catches us all off guard. It usually lightens the mood enough and brings us back to agreement. What then are some of the things that help make it to 26 years? Recognizing your differences. Donna doesn't like exercising or sweat. I hate cooking. We both know these things and so have learned to not expect the other person to change it. It took a few years of trying to convince the other to like something they didn't before we realized that it's really okay if they're okay with it. Your good qualities will sometimes rub off. Donna will admit that one thing I've brought to her life is being a little more laid back, a little more "in the moment." In turn, I would say that she has taught me how to be better prepared (for whatever) and that being organized and having a plan is a good thing. Those first few years of marriage these differences kind of drove us crazy. Now, we've both turned them to good. Little things matter. Making coffee, cleaning up after yourself and the kids, doing projects unprovoked, recognizing when they seem anxious or preoccupied, texting them and "I love you" for no good reason other than you do, doing for them tasks they don't enjoy. These little things add up to one big thing. Love. Recognize the hard times and grind them out. The first three years after Ben was born and Sarah was three years older was probably the hardest time in our marriage. Lots of physical demands on both of us and we were in the trenches of parenthood. Lots of great memories and quite a few trying times as well. We both knew it would get easier, and a few years later it did. Practice your faith. In our 26 years of marriage we have been a part of three different churches. For a time, we were at different points in our journey, but have finally caught up with one another and have found that our faith brings us together and our love keeps us there. Laugh. I can't say enough about how it is to have someone you can share your day with and laugh until you're doubled over. We have raised our children to laugh as well, and it keeps us all sane. Communication. One of the things I look forward to the most is our weekly coffee date. Every Saturday we get together for coffee, laugh, and plan our week. It's one on one time that I cherish, but you have to make it a priority. These are just some of the things that bond us to one another. There are so many little things - day to day happenings - that help with the process. We're not perfect though. There are things she does that drive me crazy and vice verse. Sometimes we joke about them, other times we just eye-roll. But ultimately both of us know that we're in this for the long haul, so the quirks come with the qualities. Here's to a happy marriage.